I made this dish from the leftover laksa noodles ingredients. All I added to it was a little salted fish to bring out the salted fish flavor. Prepare noodles: for rice noodles– soak in cold water to soften, then boil in water until they turn transparent (do not overcook rice noodles or they breaks easily). Strain and set aside. 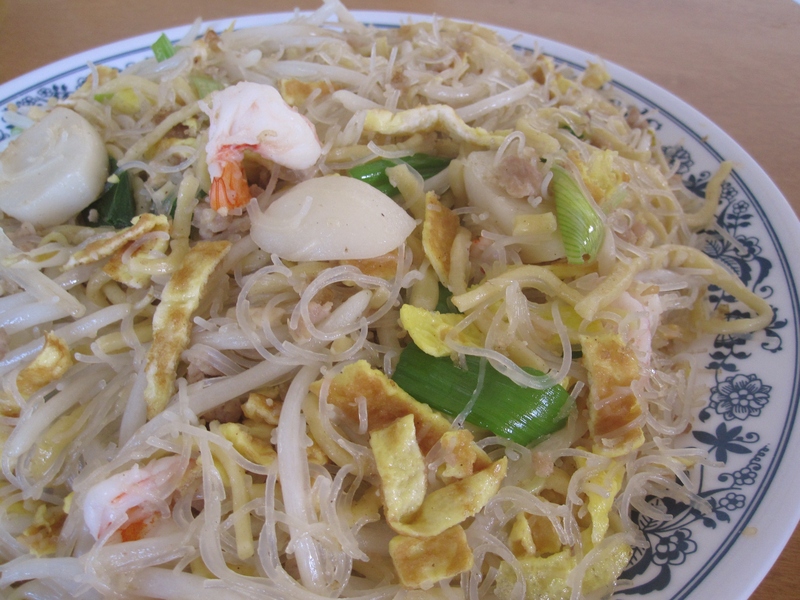 For fresh cooked yellow noodles– since they are already cooked, just blanch in hot water to loose up. Strain and set aside. Heat 2 tbsp of oil in a wok on high heat until it’s smoking hot. Add fish balls and fry to slightly brown. Add garlic and salted fish, stir briefly until aromatic. Add in meat and stir until the meat is half cooked. Add in shrimps and stir until meat is cooked and shrimps are just cooked. Dish out but maintain the heat. Add in more oil to the wok, stir fry noodles on high heat. Return meat, fish balls, and shrimps to the wok. Add in egg omelet strips, bean sprouts, and green onion. Stir a few times to mix all ingredients together. Add seasonings to taste.